Western Massachusetts provides a diversity of cross country ski experiences unequalled anywhere. From rustic mountain-top lodges and elegant Berkshire mansions to land preserves and working farms, the variety of nordic venues here will impress you. Prospect Mountain maintains 30+ kilometers of trails. When the snow begins to fall, the trails are expertly groomed for both skate and classical cross-country skiing. Most trails have tracks set on either side with a wide skating lane in the center. There are also special snowshoeing and classical skiing trails. Trail difficulties range from beginner to extreme expert. 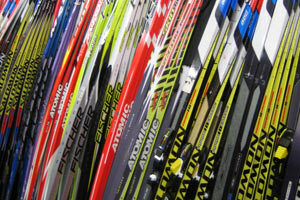 The New England Nordic Ski Association (NENSA) is the community Olympic development program for cross-country skiing in New England as well as the umbrella for most organized Nordic skiing events in the region. NENSA hosts over 50 events and more than 20 clinics for skiers and coaches at venues across the Northeast. Cross-country skiing, as practiced by our youth skiers and families, is a lifetime activity firmly rooted in New England tradition. Cross-country ski racing, as performed in the NENSA Eastern Cup series, and at our Championship Events, is a fast, explosive, and visually dynamic sport. We purchased FasterSkier.com from Cory Smith and Torbjorn Karlsen in the summer of 2007. Cory and Torbjorn started the site because they saw a need for an informative resource for cross country racers, run by cross country racers. Our goal is to continue to provide high quality Nordic news and information and to grow FasterSkier into a vibrant community resource. Here is a sampling of what sets us apart. The U.S. Ski and Snowboard Association (USSA) is the national governing body of Olympic skiing and snowboarding. It is the parent organization of the U.S. Ski Team, U.S. Snowboarding and U.S. Freeskiing. Developed to facilitate participation in national and international competition, the Olympic sports organization provides structure for competitive skiing and snowboarding. From grassroots programs to governance of sport, management of rules, competitions and athletic rankings, the USSA oversees athletic pipelines for development in the sports. With a vision to make the USA the best in the world in Olympic skiing and snowboarding, the USSA provides leadership and direction for tens of thousands of young skiers and snowboarders who share an Olympic dream while maintaining a strong adherence to core values. The USSA, established in 1905, operates out of the national training and education facility, the Center of Excellence, in Park City, UT. The Master Skier Ski Journal started 26 years ago to give cross country racers a publication of their own. We think we've done a pretty good job. Each issue is packed with insights from the world's top nordic experts. There are 10 hydroelectric dams along the 73-mile length of the Deerfield River, earning it its nickname, "The Hardest Working River". The river originates in southern Vermont where the two largest storage reservoirs, Somerset and Harriman, are located. The Westfield River Whitewater Races, held every year since 1953, are the oldest continuously run canoe races in the US. Be sure to check out the history of the race, the gallery of photos from previous years on our website. Post messages, find information from fellow paddlers, event listings and much more! The New England Canoe and Kayak Racing Association is an organization run by volunteers, dedicated to advancing the sport of canoe and kayak racing for paddlers of all skill levels. NECKRA seeks to support established and successful community boating programs to facilitate awareness of and interest in marathon and downriver racing. Comprehensive resource for adventure travel, outdoor sports and gear, national parks, and more. Since 1916, the American people have entrusted the National Park Service with the care of their national parks. With the help of volunteers and park partners, we are proud to safeguard these nearly 400 places and to share their stories with more than 275 million visitors every year. The Appalachian Mountain Club promotes the protection, enjoyment, and understanding of the mountains, forests, waters, and trails of the Appalachian region.